Genworth Financial Mortgage Insurance Company Canada (Genworth Canada) is a subsidiary of Genworth MI Canada Inc. (TSX: MIC). As the largest private residential mortgage insurer in Canada, Genworth Canada provides mortgage default insurance to Canadian residential mortgage lenders, making homeownership more accessible to first-time homebuyers. Genworth Canada differentiates itself through superior customer service, innovative processing technology and a robust risk management framework. For almost two decades, Genworth Canada has supported the housing market by providing thought leadership and a focus on the safety and soundness of the mortgage finance system. As at December 31, 2013, Genworth Canada had $5.7 billion in total assets and $3.1 billion in shareholders' equity. Genworth Canada is a leader in mortgage industry training and education. Our professionals are recognized experts, regularly called on to speak at industry conferences and offer training seminars on mortgage insurance, industry trends, specific products and services, and effective sales techniques. During Genworth Canada's 2013 Homeownership Education Week, we attracted hundreds of in-person and webcast participants to our half-day seminar, featuring senior fi nance, economic, mortgage and real estate industry professionals discussing recent trends and developments in homebuyer behavior and the housing market. Genworth Canada offers consumers far more than mortgage insurance. We offer our insured homeowners support throughout the homeownership cycle. So, when two elderly homeowners with little equity in their residence recently decided to move to an eldercare facility, they called on Genworth Canada for help. Our hands-on approach to shortfall sales demonstrates that what we do truly makes a difference to homeowners. We recognize that our customer and shareholder interests are aligned, and we offer partnership and service to ensure we all come out ahead. We pride ourselves on a collaborative approach and high service levels that can be counted on in good times and in bad. One family in Alberta found themselves confronting one of these unexpected situations when they learned that the fl oorboards of the home they purchased were rotting with black mould. Experts deemed it uninhabitable without costly mould removal and renovations. Our vision is to make the dream of homeownership a reality for Canadians. We act on it diligently by channeling our resources towards homes for those in need, and investing in financial literacy education that empowers today's youth to become tomorrow's success stories. 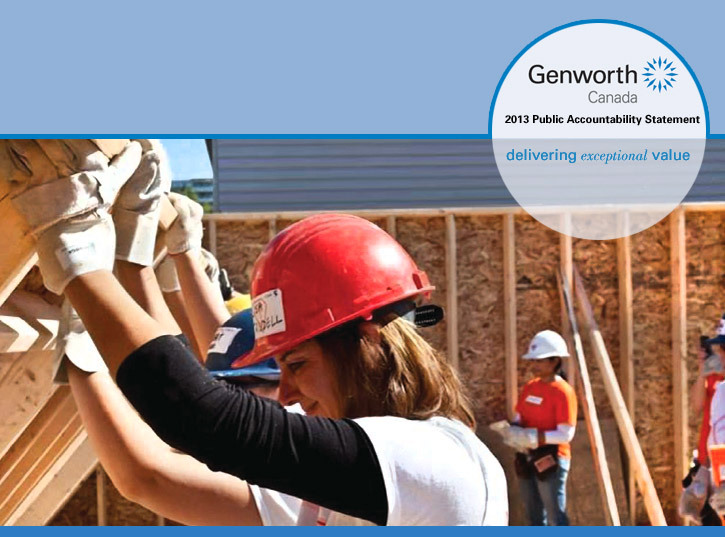 Genworth Canada works closely with numerous governments, agencies, builders and community groups in support of affordable homeownership initiatives across the country. We are a proud member of the Canadian Housing and Renewal Association, an organization that provides a national voice on housing issues. In addition to numerous in-kind donations and countless volunteer hours, Genworth Canada's cash-based contributions to community causes in 2013 totalled $ 735,000. Since 2007, Genworth Canada has contributed $675,000 through our annual Meaning of Home contest to help Habitat for Humanity affiliates build homes for deserving families. 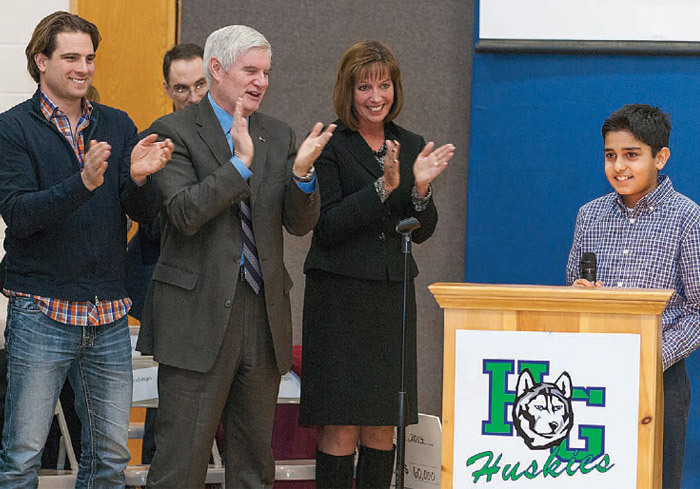 Every year, students nationwide submit essays for a chance to direct a $60,000 Genworth Canada grant to a Habitat build of their choice, plus one of five runner-up grants of $5,000 to a Habitat affiliate. We continually invest in the experience of our 250+-strong workforce. They are the people with the commitment and expertise behind Genworth Canada's success. Throughout the year, we provide our employees with training and development opportunities to enrich their knowledge and future career prospects at our Company. Genworth Canada is fortunate to have a wealth of long-tenured employees. In 2013, Genworth Canada paid more than $90 million in Corporate Income Tax and Premium Tax to the Federal and Provincial governments. The Chairman's Award of Excellence is awarded each year to top performers who in the course of the past year have contributed to business performance and culture in a meaningful way. "Winning this award would not have been possible without the amazing teams I worked with in 2013. I would like to thank them for their hard work and dedication." "The day before I found out about winning the Compass Award, I told my wife how lucky I feel to work with so many great people. Genworth is a company that truly empowers its employees." "My team has had an extremely busy and productive past few years…. I would like to extend my Compass Award win to the Loss Modeling Team, as they are equally deserving of the honour."